› Author AffiliationsWe thank Colorado State University for the startup funding used to support this work. The direct anti-Markovnikov addition of alcohols to styrene derivatives represents a streamlined route to β-phenethyl ethers, a substructure frequently found in pharmaceuticals and other bioactive ­molecules. Here, we discuss how the development of such a reaction can complement and address limitations of current methods for β-phenethyl ether synthesis. 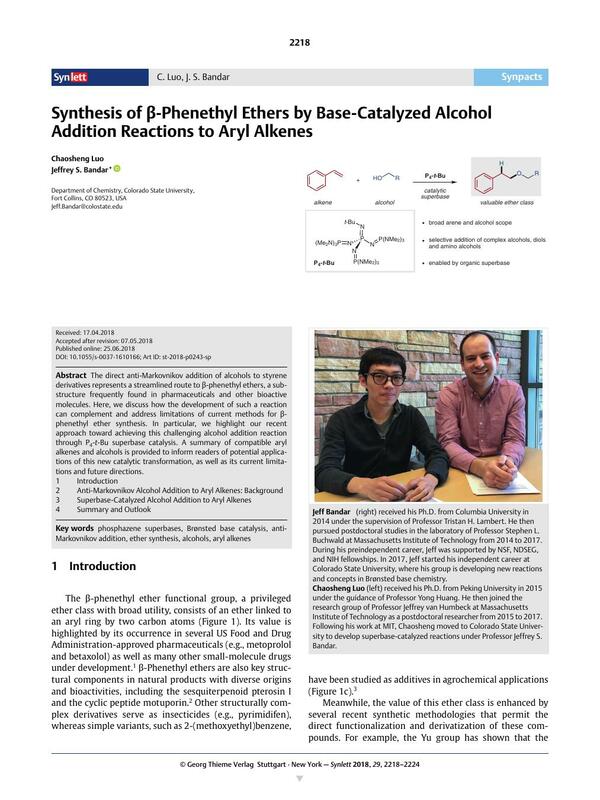 In particular, we highlight our recent ­approach toward achieving this challenging alcohol addition reaction through P4-t-Bu superbase catalysis. A summary of compatible aryl alkenes and alcohols is provided to inform readers of potential applications of this new catalytic transformation, as well as its current limitations and future directions.